I can go for a four hour walk, uphill both ways, and feel tired but invigorated. I sit through a four hour lunch and I barely have the energy to breath. Fortunately, this time I remembered my little pocket camera, so I’ll tell you about it in pictures. I don’t think my mind can function well enough to find the words. A month or so ago we went to an evening ‘hunt’ dinner at one of the neighboring villages with friends from that village. Today, we all met for the hunt dinner at our village. These meals are organized and prepared by the local hunter’s clubs. 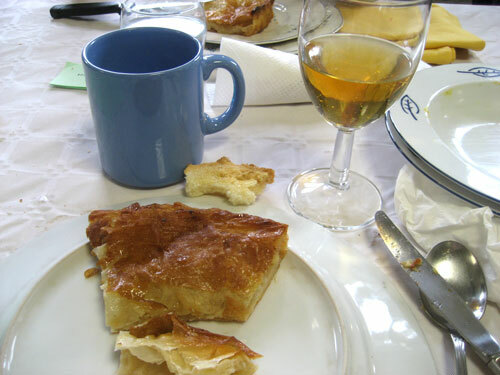 The meals are started with an Apéritif – today that was Sangria with a plate of nuts, olives, crisps, and other salty snack stuff. 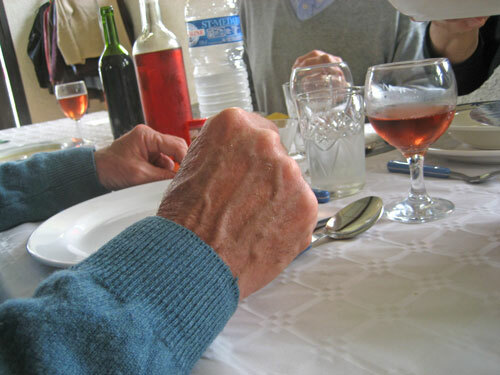 Bottles of red and rose wine with no labels and water are set out on the tables and replaced as needed. Bowls / platters of whatever is being served is set down every few places, we all help ourselves. then it’s refilled and carried on down the table until everyone is served. 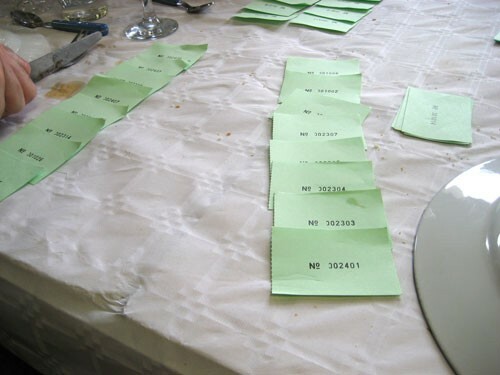 Today there were three long tables, each seating about 45 people. 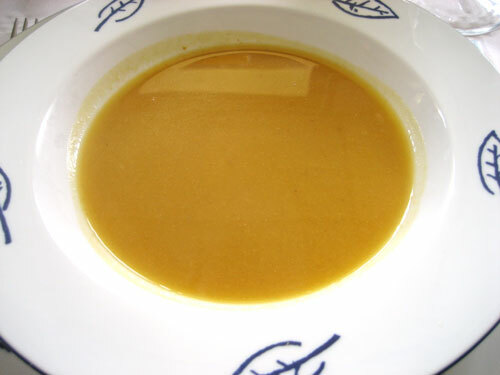 Our first course was Pumpkin Soup. The chef had a nice touch with the spices…. Moroccan flavors, I think. 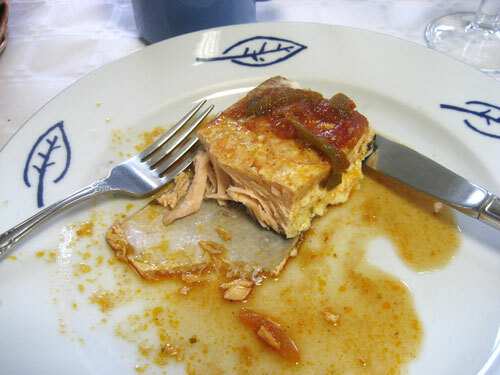 Next came a Filet of Salmon with a very spicy tomato pepper sauce. 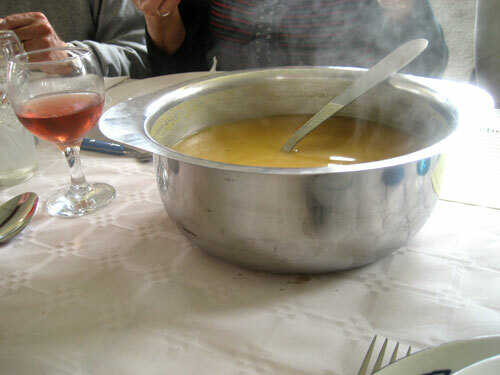 This was followed by Venison Stew – I managed to only get a small portion. This was served with garlic toasts. Finally, the main course of roasted Leg of Venison with Gratin Potatoes. 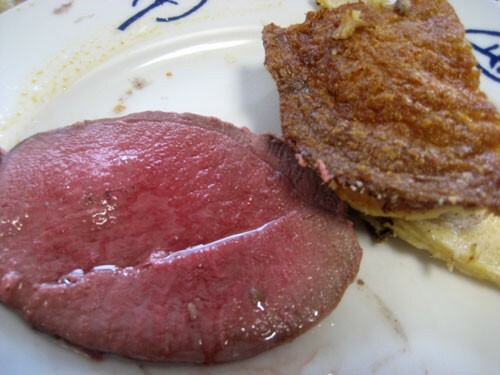 That was the best, most tender piece of venison I’ve ever had. We bring our own plates, glasses and cutlery to these events. This is how one cleans their plate between courses. You can understand why I was cautious with the serving sizes. 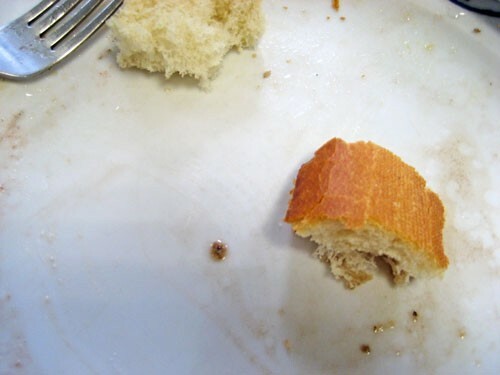 There is no place to put leftover food – one cleans one’s plate. That also means one has to drink all the wine that is poured, all the water, all the coffee, etc. 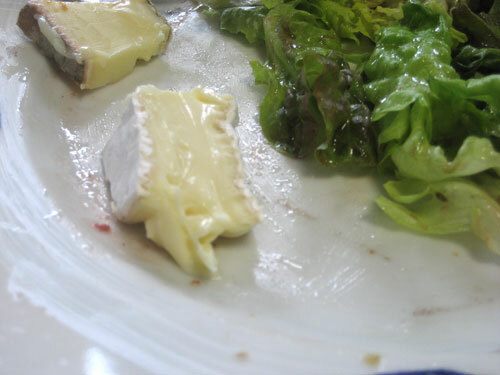 After the main course we had salad and cheese…. And it was a most impressive, most tempting cheese platter. I exercised restraint. The French may be very proper but they are also very practical…. 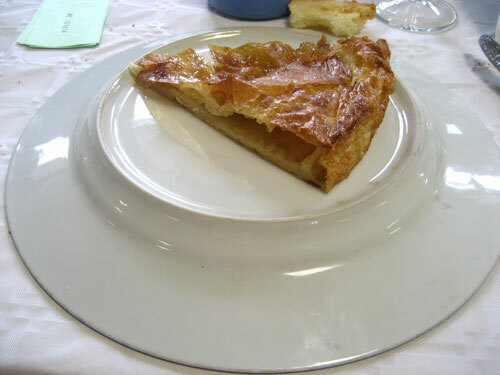 For the apple tart we were told to turn our plates over. Worked perfectly. For our entertainment while eating dessert there was a lotto. Today the prizes were haunches of venison or wild boar. We didn’t win anything, but one of our friends got to haul a leg of venison off to his freezer. As we enjoyed the apple tart, bottles of cidre (cider) were plopped on all the tables and the coffee was poured. Because we are light-weights we left before the after dinner drinks were brought round. 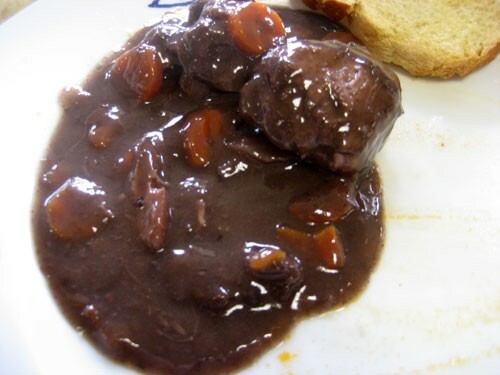 I think our village’s hunt dinner was much better than the other village’s….. Really, all of the food was outstanding. And now I think a nap is in order…..
Wow Katie…what a feast! Sound absolutely divine…wish I was there! I love these dinners Katie. What fun to turn your plate upside down roe dessert! It’s great to hear you wore your skinny jeans. Recently in Sevilla we noticed that almost every woman,young and old, was wearing them. My wife was reluctant but I talked her into buying a pair. She looks great in them. I love your pictorial. I am amazed by all of the courses. I would need a nap too. Serious napping, for sure! Glad you had a fun outing. Good idea for the hosts to have you bring your own plates, etc. it limits your portions as well as their cleanup. Penny, so was I…. amazed. Zoomie, it seemed very strange the first time, but what a great idea for large parties. And easy. Wow so much food – where did you put it all – I agree, totally exhausting. I err on the side of vegetarianism so I would not have done justice to any of those courses except the apple tart and I could have had that for all courses ! !